Choosing wood windows for your home is a good investment. But what about the classic elements that make wood windows look even more traditional? Wood shutters to accompany your wood windows can be the design element you need to make your home the most unusual in the neighborhood! 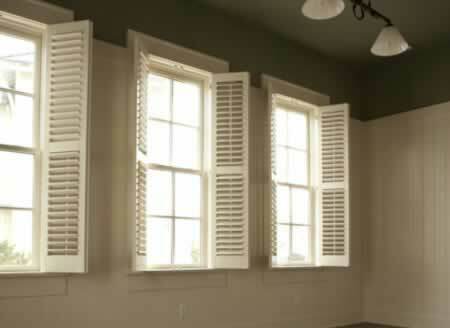 Wood shutters don't have to be the simple, fixed shutters that are popular on many homes with vinyl windows. Why not opt for shutters that work, and have sturdy latches to keep them closed during the harshest of severe weather? Homes in coastal areas often have shutters that are easily closed in the event of hurricanes and high winds. Even your inland home can make the most of shutters, especially if you opt to do something really unusual, and put the shutters on the inside of the windows rather than the outside. The interior shutters add a unique design element and still provide a way to block the sun if necessary.